On Jan. 3, 2019, Jeffrey Vitter will step down as chancellor of the University of Mississippi, marking the end of his three-year tenure as the leader of Ole Miss. For many, he will be remembered as Ole Miss’ chancellor during the school’s long-fought battle with the NCAA and its Committee on Infractions. Vitter’s tenure as chancellor could easily be defined by the NCAA’s case against Ole Miss. The Committee on Infractions issued its first Notice of Allegations against the university just 20 days after he took office, with the final verdict in the case coming only days before the announcement of his resignation. Vitter officially took office as the University of Mississippi’s chancellor on Jan. 1, 2016, almost four years after the NCAA investigation into Ole Miss Athletics began. However, just three weeks into his tenure on Jan. 22, the university received the first Notice of Allegations from the NCAA Committee on Infractions, alleging violations in women’s basketball, track & field and football. In the statement, Vitter and Bjork admit to violations within the athletic department, but contend the severity of those violations. In addition to contending the severity of select violations, Vitter and Bjork’s statement announced that the university would be self-imposing sanctions in line with the usual punishment for such violations. In October 2016, the NCAA’s case against Ole Miss women’s basketball and track & field came to a close with no additional action being taken against either program. “We regret the violations of NCAA bylaws in both programs and have taken several steps to prevent future violations,” Vitter said. Following the conclusion of the women’s basketball and track & field case, the Committee on Infractions sent Ole Miss an updated Notice of Allegations focusing solely on the football program. The updated notice outlined eight new violations, in addition to the 13 in the first notice. On Feb. 22, 2017, Vitter, Bjork and then-head football coach Hugh Freeze appeared in a prerecorded video addressing the Committee on Infractions’ updated Notice of Allegations. During the video, Bjork announced that the university would be imposing more sanctions on itself, in hopes that it would ultimately soften the COI’s final verdict. 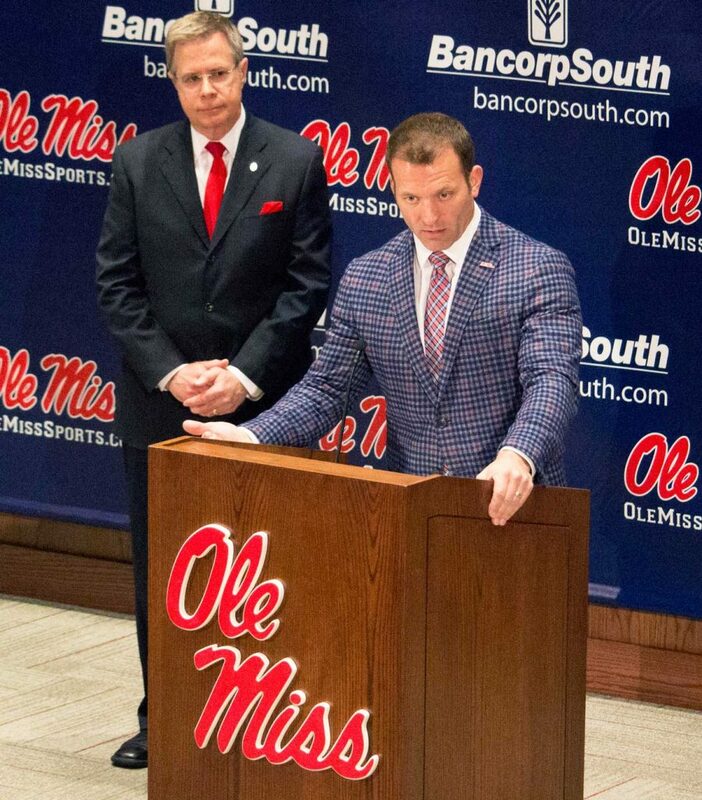 A short time later, on July 20, Vitter and Bjork held a press conference to announce Hugh Freeze’s resignation as the head coach of Ole Miss Football. The administrators stressed that Freeze’s resignation did not tie-in with the NCAA’s allegations against the football program, but rather with concerns of his personal conduct. With Freeze’s resignation, Matt Luke was named the interim head coach for the 2017 season. In December 2017, the Committee on Infractions issued its final report on the Ole Miss case. The COI disagreed with Ole Miss’ stance on the allegations, adding an additional year to the university’s self-imposed 2017 postseason ban. Two weeks later, Ole Miss submitted a notice to appeal the 2018 postseason ban and other penalties highlighted in the COI’s final report to the NCAA’s Infractions Appeals Committee. November saw the final episode of Ole Miss’ NCAA saga, when Ole Miss received the appeals committee’s response to the university’s appeal. The appeal upheld the 2018 postseason ban, but overturned other sanctions related to recruiting. “While we are pleased by the (committees) finding that the COI abused its discretion with respect to the unofficial visit penalty, we remain disappointed by the remainder of the ruling, which upheld a 2018 postseason ban and findings of lack of institutional control and recruiting inducements,” a university statement read, effectively ending the NCAA’s case against Ole Miss. Vitter’s arrival in 2016 and the announcement of his resignation late in 2018 closely align with the timeline of the NCAA’s case against Ole Miss’ football program. The university has yet to release an official explanation of Vitter’s departure, but the timing of his resignation and the timing of the conclusion of the case are eerily similar.